Tonia Yocum completed Physician Assistant school at Alderson-Broaddus College in West Virginia, with a Bachelor of Medical Science and Sports Medicine. She is board certified by the National Commission of Physician Assistants and licensed to practice by the Commonwealth of Virginia. 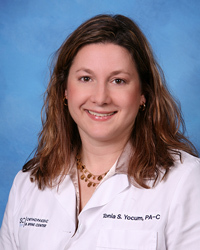 She has been a practicing P.A.-C since 1996, with emphasis on Orthopaedic Surgery. She joined Dr. Carlson and OSC in 2002. She is a member of the American Academy of Physician Assistants and Virginia Academy of Physician Assistants.